2. You may use fresh or frozen asparagus. If using fresh, snap the woody ends off. Bring water to boil in a large skillet over medium-high heat. Add asparagus stalks to skillet, cover and cook until tender, about 2-4 minutes. For frozen, I like to get the kind you can steam in the bag in your microwave. Follow directions on package. 3. 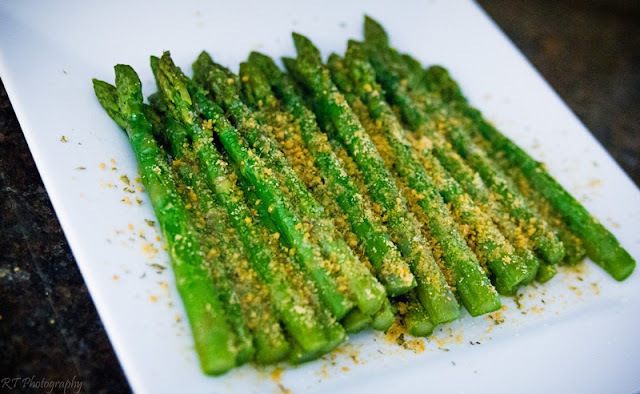 Spread out asparagus stalks on a baking sheet and generously drizzle with Sciabica's Mission Spring Harvest Olive Oil. Sprinkle sea salt and grated Parmesan cheese on top. I used Kraft's Parmesan Cheese Herb Blend. 4. Place in oven and broil about 4-8 minutes, or until asparagus is tender and cheese has browned. elektrische Pfeffermühlen oder auch electric Peppermills. Enjoyed every bit of your blog post.Really looking forward to read more. Fantastic.